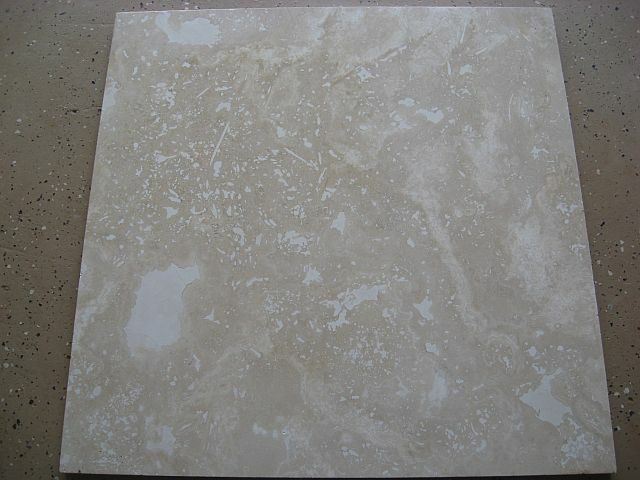 If you have travertine most likely what we talk about in this post will be relevant for you. Maybe you have travertine holes that seemingly appear out of nowhere? Often heavy objects are pulled across a floor without regard or a heavy object has been dropped on the travertine. 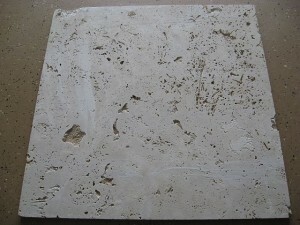 Cleaning travertine holes can present a challenge as well, but why are they there to begin with? The fact is that the holes are there – in many places they just have not been brought to your attention – yet. Here are two pictures for you to consider. 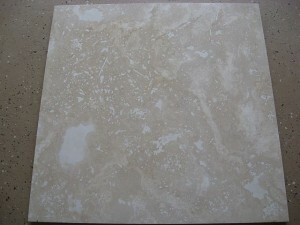 The picture on the left is the travertine bought new from the store. The picture on the right is the same tile flipped over showing us the back. Notice anything different? 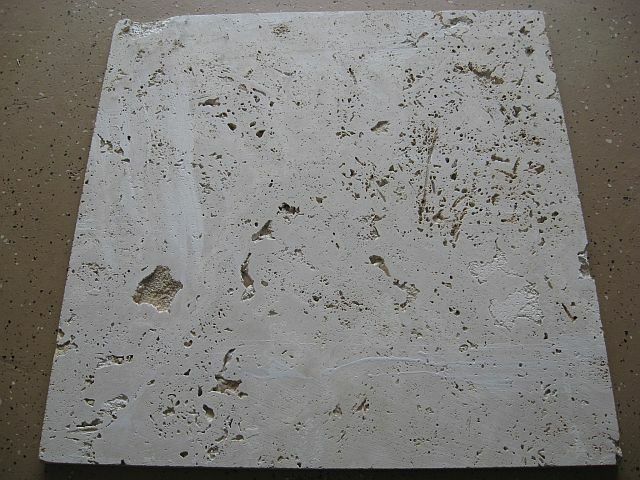 The travertine holes that you are seeing are the result of being exposed due to the very thin layer above them being damaged. Where there are no holes on this tile we will not have any problems from the topside, but on the other hand if there is a void just below the surface then it has the possibility of being exposed. A good example of how a force on small area can result in a very high pressure is seen in women’s shoes with high spiked heels. These types of shoes can cause damage to some floors due to the very high pressure on the floor at the heel. An average shoe distributes the weight of the person over 20 square inches. Thus, a 100-pound person applies 100/20 = 5 pounds per square inch on the floor. Since a spike-heel is only 0.25 square inches, the 100-pound person would be applying 100/0.25 = 400 pounds per square inch on the floor at the heel! In some cases, that is sufficient to damage the floor. When your travertine is a very low hone (very little to no reflection) then you can generally install matching sanded grout to fill the void. With travertine that has a higher reflection then the difficulty in repairing them should be left to a professional. Matching tile sheen and colors can be tricky. When cleaning travertine holes it is important to vacuum out the holes very thoroughly. Be careful as the hole can spread as the edges get crushed by further impacts making repairs that much more difficult! « So you want Marble Counters? Bruce did some repair work on our travertine floors to fix holes pressed through the thin surface layer on 1/3/12 and, I have to tell you, we can’t even find where he did the repair work!!! Beautiful job done, Bruce was right on time for his appointment, completely professional and took the time to explain what he was doing, why and how to care for our stone floors and showers. This was the first time we’ve used Bruce, but will not be the last.